Biking the Versailles gardens is a spectacular way to enjoy them. Covering the almost 2000 acres on foot would take days as there are way too many great things to see and great distances between them. The royalty rode horses or in carriages, you can have the joy of a nice bike ride. Your Versailles guide will take you to the biggest highlights of the garden which are often missed by people on foot; Marie Antoinette’s country-style hamlet, the Petit Trianon and the Grand Trianon. Marie Antoinette’s 1777 hamlet is so picturesque, it could be it own tour. 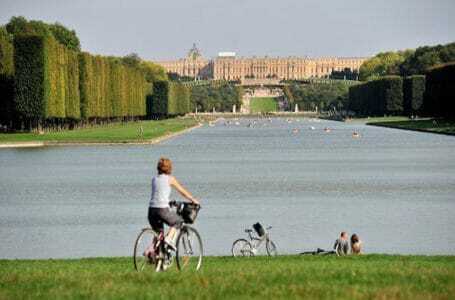 You will enjoy a picnic lunch with you guide by the Grand Canal before heading inside the Palace of Versailles. We are excited to have Blue Bike Tours provide this tour to you for us. 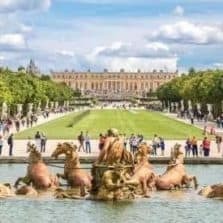 They have the highest rating for Versailles bike tours and we find their itinerary, guides and service to be of the highest quality. After meeting in Paris – your guide rides the RER train with you for the 20 to 25 minutes to Versailles. Your bike pickup is nearby as well as the village market to purchase baguettes, cheese, ham, wine and whatever else you’d like to feast on (own expense). This is for your Grand Canal picnic lunch later in the day. A quick ride from the market to Versailles and you will be in the majestic gardens. Your guide will lead you through the 2000-acre park with long stops a the most picturesque hamlet – Marie Antionette’s 1777 recreated village which includes a small working farm from 250 years ago. It also includes the Petit Trianon and Grand Trianon. Enjoy lunch where the great Louis kings enjoyed their Palace and then head back to visit the inside of the grand Chateau – the Palace of Versailles. Your visit there includes all of the highlights of the Palace — the King’s State Apartments and Chapel, and walk through the unforgettable Hall of Mirrors, where the treaty ending WWI was signed. Return your bikes and helmets and catch the train home, with still time to have a nice dinner in Paris. The bike riding is flat and about 10 miles spread over several hours. If a children’s bike is required, you must advise at time of booking. Operates in all weather conditions, please dress appropriately. You will cover an area of approximately 10 miles on a relatively flat terrain. The ride is leisurely and therefore suitable for all levels of fitness. Child seats are available if requested at the time of booking. Tandem bikes are available for children aged 10 years and younger.